Average circulation in the south Pacific Ocean. El Niño-Southern Oscillation (ENSO; commonly referred to as simply El Niño) is a global coupled ocean-atmosphere phenomenon. 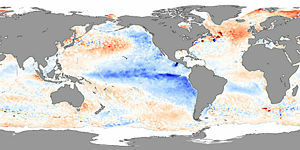 The Pacific Ocean signatures, El Niño and La Niña are important temperature fluctuations in surface waters of the tropical Eastern Pacific Ocean. The name El Niño, from the Spanish for "the little boy," refers to the Christ child, because the phenomenon is usually noticed around Christmas time in the Pacific Ocean off the west coast of South America. La Niña, similarly, means "the little girl." 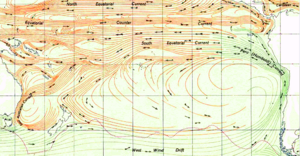 These effects were first described in 1923 by Sir Gilbert Thomas Walker from whom the Walker circulation, an important aspect of the Pacific ENSO phenomenon, takes its name. The atmospheric signature, the Southern Oscillation (SO) reflects the monthly or seasonal fluctuations in the air pressure difference between Tahiti and Darwin, Australia. The most recent occurrence of El Niño started in September 2006 and lasted until early 2007. From June 2007 on, data indicated a weak La Niña event, strengthening in early 2008. ENSO is associated with floods, droughts, and other disturbances in a range of locations around the world. These effects, and the irregularity of the ENSO phenomenon, makes predicting it of high interest. ENSO is the most prominent known source of inter-annual variability in weather and climate around the world (about 3 to 8 years), though not all areas are affected. ENSO has signatures in the Pacific, Atlantic and Indian Oceans. During major warm events, El Niño warming extends over much of the tropical Pacific and becomes clearly linked to the intensity of the Southern Oscillation. While ENSO effects are basically in phase between the Pacific and Indian Oceans, ENSO effects in the Atlantic Ocean lag behind those in the Pacific by 12 to 18 months. Many of the countries most affected by ENSO are developing countries that are largely dependent upon their agricultural and fishery sectors for food supply, employment, and foreign exchange. New capabilities to predict the onset of ENSO events can have global socio-economic impacts. While ENSO is a natural part of the Earth's climate, an important concern is whether its intensity or frequency may change as a result of global warming. Low-frequency variability has been evidenced; interdecadal modulation of ENSO from the Pacific Decadal Oscillation (PDO) or the Interdecadal Pacific Oscillation (IPO) might exist. This could explain the so-called protracted ENSO of the early 1990s. El Niño Conditions. Warm water pool approaches South American coast. 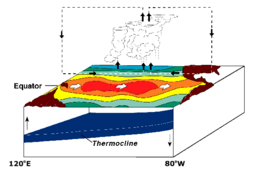 Absence of cold upwelling increases warming. La Niña Conditions. Warm water is further west than usual. El Niño and La Niña are officially defined as sustained sea surface temperature anomalies of magnitude greater than 0.5°C across the central tropical Pacific Ocean. When the condition is met for a period of less than five months, it is classified as El Niño or La Niña conditions; if the anomaly persists for five months or longer, it is classified as an El Niño or La Niña episode. Historically, it has occurred at irregular intervals of 2-7 years and has usually lasted one or two years. El Niño's warm current of nutrient-poor tropical water, heated by its eastward passage in the Equatorial Current, replaces the cold, nutrient-rich surface water of the Humboldt Current, also known as the Peru Current, which support great populations of food fish. In most years the warming lasts only a few weeks or a month, after which the weather patterns return to normal and fishing improves. However, when El Niño conditions last for many months, more extensive ocean warming occurs and its economic impact to local fishing for an international market can be serious. 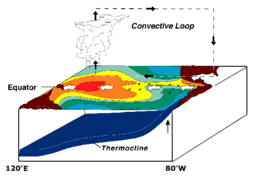 During non-El Niño conditions, the Walker circulation is seen at the surface as easterly trade winds which move water and air warmed by the sun towards the west. This also creates ocean upwelling off the coasts of Peru and Ecuador and brings nutrient-rich cold water to the surface, increasing fishing stocks. The western side of the equatorial Pacific is characterized by warm, wet low pressure weather as the collected moisture is dumped in the form of typhoons and thunderstorms. The ocean is some 60 cm higher in the western Pacific as the result of this motion. In the Pacific, La Niña is characterized by unusually cold ocean temperatures in the eastern equatorial Pacific, compared to El Niño, which is characterized by unusually warm ocean temperatures in the same area. Atlantic tropical cyclone activity is generally enhanced during La Niña. The La Niña condition often follows the El Niño, especially when the latter is strong. Because El Niño's warm pool feeds thunderstorms above, it creates increased rainfall across the east-central and eastern Pacific Ocean. The effects of El Niño in South America are direct and stronger than in North America. An El Niño is associated with warm and very wet summers (December-February) along the coasts of northern Peru and Ecuador, causing major flooding whenever the event is strong or extreme. The effects during the months of February, March and April may become critical. Southern Brazil and northern Argentina also experience wetter than normal conditions but mainly during the spring and early summer. Central Chile receives a mild winter with large rainfall, and the Peruvian-Bolivian Altiplano is sometimes exposed to unusual winter snowfall events. Drier and hotter weather occurs in parts of the Amazon River Basin, Colombia and Central America. Direct effects of El Niño resulting in drier conditions occur in parts of Southeast Asia and Northern Australia, increasing bush fires and worsening haze and decreasing air quality dramatically. Drier than normal conditions are also generally observed in Queensland, inland Victoria, inland New South Wales and eastern Tasmania from June to August. West of the Antarctic Peninsula, the Ross, Bellingshausen, and Amundsen Sea sectors have more sea ice during El Niño. The latter two and the Weddell Sea also become warmer and have higher atmospheric pressure. In North America, typically, winters are warmer than normal in the upper Midwest states, the Northeast, and Canada, while central and southern California, northwest Mexico and the southwestern U.S., are wetter and cooler than normal. Summer is wetter in the intermountain regions of the U.S. The Pacific Northwest states, on the other hand, tend to experience dry but foggy winters and warm, sunny and precocious springs during an El Niño. During a La Niña, by contrast, the Midwestern U.S. tends to be drier than normal. El Niño is associated with increased wave caused coastal erosion along the US Pacific Coast and decreased hurricane activity in the Atlantic, especially south of 25º N; this reduction is largely due to stronger wind sheartropics. Finally, East Africa, including Kenya, Tanzania and the White Nile basin experiences, in the long rains from March to May, wetter than normal conditions. There also are drier than normal conditions from December to February in south-central Africa, mainly in Zambia, Zimbabwe, Mozambique and Botswana. Study of climate records has found that about half of the summers after an El Niño have unusual warming in the Western Hemisphere Warm Pool (WHWP). This affects weather in the area and seems to be related to the North Atlantic Oscillation. An effect similar to El Niño sometimes takes place in the Atlantic Ocean, where water along equatorial Africa's Gulf of Guinea becomes warmer and eastern Brazil becomes cooler and drier. This is related to El Niño's effect on the Walker circulation over South America, which causes the easterly trade winds in the western Atlantic Ocean region to strengthen. Cases of double El Niño events have been linked to severe famines related to the extended failure of monsoon rains, as in the book Late Victorian Holocausts. Along the west coast of South America, El Niño reduces the upwelling of cold, nutrient-rich water that sustains large fish populations, which in turn sustain abundant sea birds, whose droppings support the fertilizer industry. The local fishing industry along the affected coastline can suffer during long-lasting El Niño events. The world's largest fishery collapsed due to overfishing during the 1972 El Niño Peruvian anchoveta reduction. During the 1982-1983 event, jack mackerel and anchoveta populations were reduced, scallops increased in warmer water, but hake followed cooler water down the continental slope, while shrimp and sardines moved southward so some catches decreased while others increased. Horse mackerel have increased in the region during warm events. Shifting locations and types of fish due to changing conditions provide challenges for fishing industries. Peruvian sardines have moved during El Niño events to Chilean areas. Other conditions provide further complications, such as the government of Chile in 1991 creating restrictions on the fishing areas for self-employed fishermen and industrial fleets. The ENSO variability may contribute to the great success of small fast-growing species along the Peruvian coast, as periods of low population removes predators in the area. Similar effects benefit migratory birds which travel each spring from predator-rich tropical areas to distant winter-stressed nesting areas. There is some evidence that El Niño activity is correlated with incidence of red tides off the Pacific coast of California. It has been postulated that a strong El Niño led to the demise of the Moche and other pre-Columbian Peruvian cultures. A recent study of El Niño patterns suggests that the French Revolution was caused in part by the poor crop yields of 1788-1789 in Europe, resulting from an unusually strong El-Niño effect between 1789-1793. La Niña is the name for the cold phase of ENSO, during which the cold pool in the eastern Pacific intensifies and the trade winds strengthen. The name La Niña originates from Spanish, meaning "the little girl," analogous to El Niño meaning "the little boy." It has also in the past been called anti-El Niño. La Niña causes mostly the opposite effects of El Niño, for example, El Niño would cause a wet period in the Midwestern U.S., while La Niña would typically cause a dry period in this area. There was a strong La Niña episode during 1988-1989. La Niña also formed in 1995, and in 1999-2000. The last La Niña was a minor one, and occurred 2000-2001. Currently, there is a moderate La Niña, which began developing in mid-2007. NOAA confirmed that a moderate La Niña developed in their November El Niño/Southern Oscillation Diagnostic Discussion, and that it will likely continue into 2008. According to NOAA, "Expected La Niña impacts during November – January include a continuation of above-average precipitation over Indonesia and below-average precipitation over the central equatorial Pacific. For the contiguous United States, potential impacts include above average precipitation in the Northern Rockies, Northern California, and in southern and eastern regions of the Pacific Northwest. Below-average precipitation is expected across the southern tier, particularly in the southwestern and southeastern states." In March 2008, La Niña caused a drop in sea surface temperatures over Southeast Asia by an amount of 2°C. It also caused heavy rains over Malaysia, Singapore and Indonesia. A few years ago, attribution of recent changes (if any) in ENSO or predictions of future changes were very weak. More recent results tend to suggest that the projected tropical warming may follow a somewhat El Niño-like spatial pattern, without necessarily altering the variability about this pattern, while the ENSO cycle may be minimally shortened. The mechanisms which might cause an El Niño event are still being investigated. It is difficult to find patterns which may show causes or allow forecasts. As the phenomenon is located near the equator, events in both hemispheres may have an effect. As the weather events are somewhat chaotic, the onsets of El Niño-events may also be. This is not to say predicting is totally impossible. Jacob Bjerknes in 1969 suggested that an anomalously warm spot in the eastern Pacific can weaken the east-west temperature difference, causing weakening in the Walker circulation and trade wind flows, which push warm water to the west. The result is increasingly warm water toward the east. Klaus Wyrtki in 1975 proposed that increased trade winds could build up the western bulge of warm water, and any sudden weakening in the winds would allow that warm water to surge eastward. However, there was no such buildup preceding the 1982-1983 event. Recharge oscillator: Several mechanisms have been proposed where warmth builds up in the equatorial area, then is dispersed to higher latitudes by an El Niño event. The cooler area then has to "recharge" warmth for several years before another event can take place. Western Pacific oscillator: In the western Pacific, several weather conditions can cause westerly wind anomalies. For example, cyclones north and south of the equator force west-to-east winds between. Such wind may counteract the typical easterly flows across the Pacific and create a tendency toward continuing the eastward motion. A weakening in the westward currents at such a time may be the final trigger needed to shift into an El Niño. Equatorial Pacific Ocean may tend to be near El Niño conditions, with several random variations affecting behavior. Weather patterns from outside the area or volcanic events may be some such factors. The Madden-Julian Oscillation (MJO) is an important source of variability that can contribute to a more rapid evolution toward El Niño conditions through related fluctuations in low-level winds and precipitation over the western and central equatorial Pacific. Eastward-propagating oceanic Kelvin waves can be produced by MJO activity. The MJO may in turn be influenced by a developing El Niño, leading to a positive feedback. The first mention of the term "El Niño" to refer to climate occurs in 1892, when Captain Camilo Carrillo told the Geographical society congress in Lima that Peruvian sailors named the warm northerly current "El Niño" because it was most noticeable around Christmas (late December). However, even before then the phenomenon was of interest because of its effects on biological productivity, with its effects on the guano industry. Normal conditions along the west Peruvian coast are a cold southerly current (the Humboldt Current) with upwelling water; the upwelling nutrients lead to great oceanic productivity; the cold currents leads to very dry conditions on land. Similar conditions exist elsewhere (California Current; Benguela Current off South Africa; West Australia Current). Thus the replacement of this with warmer northerly water leads to lower biological productivity in the ocean, and more rainfall—often flooding—on land; the connection with flooding was reported in 1895 by Pezet and Eguiguren. Towards the end of the nineteenth century there was much interest in forecasting climate anomalies (for food production) in India and Australia. Charles Todd, in 1893, suggested that droughts in India and Australia tended to occur at the same time; Norman Lockyer noted the same in 1904. In 1924 Gilbert Walker (for whom the Walker circulation is named) first coined the term "Southern Oscillation." For most of the twentieth century, El Niño was thought of as a largely local phenomenon. The major 1982-1983 El Niño lead to an upsurge of interest from the scientific community. The 1998 El Niño event caused an estimated 16 percent of the world’s reef systems to die. Since then, mass coral bleaching has become common worldwide, with all regions having suffered ‘severe bleaching’. ENSO conditions seem to have occurred at every two to seven years for at least the past 300 years, but most of them have been weak. Major ENSO events have occurred in the years 1790-1793, 1828, 1876-1878, 1891, 1925-1926, 1982-1983, and 1997-1998. Also, there is evidence for strong El Niño events during the early Holocene (between 9560 and 9300 B.C.E.). Recent El Niños have occurred in 1986-1987, 1991-1992, 1993, 1994, 1997-1998, 2002-2003, 2004-2005 and 2006-2007. The El Niño of 1997-1998 was particularly strong and brought the phenomenon to worldwide attention. The event temporarily warmed air temperature by 3°F, compared to the usual increase of 0.5°F associated with El Niño events. The period from 1990-1994 was unusual in that El Niños have rarely occurred in such rapid succession (but were generally weak). There is some debate as to whether global warming increases the intensity and/or frequency of El Niño episodes. (see also the ENSO and Global Warming section above). The Southern Oscillation is an oscillation in air pressure between the tropical eastern and western Pacific Ocean waters. The strength of the Southern Oscillation is measured by the Southern Oscillation Index (SOI). The SOI is a record of the monthly or seasonal fluctuations in the normalized surface air pressure difference between Tahiti and Darwin, Australia. El Niño episodes, which are associated with negative values of the SOI, are usually accompanied by sustained warming of the central and eastern tropical Pacific Ocean, a decrease in the strength of the Pacific Trade Winds, and a reduction in rainfall over eastern and northern Australia. Conversely, La Niña episodes are associated with positive values of the SOI and are accompanied by stronger Pacific trade winds and warmer sea temperatures to the north of Australia. Waters in the central and eastern tropical Pacific Ocean become cooler during this time. El Niño effects upon North American weather and atmospheric circulation. ↑ El Niño Information. California Department of Fish and Game, Marine Region. Retrieved October 16, 2008. ↑ Rene Pastor, 9/14/2006. El Niño climate pattern forms in Pacific Ocean. USA Today. Retrieved October 16, 2008. ↑ Seth Borenstein, 2007. There Goes El Nino, Here Comes La Nina. CBS News. Retrieved October 16, 2008. ↑ Michael Pidwirny, 2006. Chapter 7: Introduction to the Atmosphere. Fundamentals of Physical Geography. Retrieved October 16, 2008. ↑ Envisat watches for La Nina. BNSC. Retrieved October 16, 2008. ↑ The Tropical Atmosphere Ocean Array: Gathering Data to Predict El Niño. NOAA. Retrieved October 16, 2008. ↑ Ocean Surface Topography. JPL. Retrieved October 16, 2008. ↑ W.G. Pearcy, and A. Schoener. 1987. Changes in the marine biota coincident with the 1982-1983 El Niño in the northeastern subarctic Pacific Ocean. Journal of Geophysical Research 92(C13):14417–14428. Retrieved October 16, 2008. ↑ Richard H. Grove, 1998. Global Impact of the 1789–93 El Niño. Nature 393(6683):318–319. ↑ ENSO Diagnostic Discussion. Climate Prediction Center. Retrieved October 16, 2008. ↑ Lynda Hong, 2008. Recent heavy rain not caused by global warming. Channel NewsAsia. Retrieved October 16, 2008. ↑ 9.3.5.2 Interannual variability ENSO. Intergovernmental Panel on Climate Change. Retrieved October 16, 2008. ↑ Matthew Collins, et al. 2005. El Niño- or La Niña-like climate change? Climate Dynamics 24(1):89–104. ↑ William J. Merryfield, 2006. Changes to ENSO under CO2 Doubling in a Multimodel Ensemble. Journal of Climate 19(16):4009–4027. Retrieved October 16, 2008. ↑ Ian Eisenman, Lisan Yu, and Eli Tziperman. 2005. Westerly Wind Bursts: ENSO’s Tail Rather than the Dog? Journal of Climate 18(24):5224–5238. ↑ J. Brad Adams, Michael E. Mann, and Caspar M. Ammann. 2003. 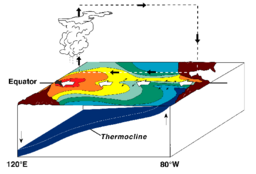 Proxy evidence for an El Niño-like response to volcanic forcing. Nature 426(6964):274–278. ↑ Paul Marshall, and Heidi Schuttenberg. 2006. A reef manager’s guide to coral bleaching. Townsville, AU: Great Barrier Reef Marine Park Authority. ISBN 1876945400. Retrieved October 16, 2008. ↑ Mike Davis, 2001. Late Victorian Holocausts: El Niño Famines and the Making of the Third World. (London, UK: Verso. ISBN 1859847390), 271. ↑ Matthieu Carrè, et al. 2005. Strong El Niño events during the early Holocene: stable isotope evidence from Peruvian sea shells. The Holocene 15(1):42–47. ↑ S.J. Mason, et al. 1999. The IRI Seasonal Climate Prediction System and the 1997/98 El Niño Event. Bulletin of the American Meteorological Society 80:1853–1873. Retrieved October 16, 2008. ↑ K.E. Trenberth, et al. 2002. of El Niño – Southern Oscillation and global atmospheric surface temperatures. Journal of Geophysical Research 107(D8): 4065 Retrieved October 28, 2008. ↑ Kevin E. Trenberth, and Timothy J. Hoar. 1996. The 1990-1995 El Niño-Southern Oscillation Event: Longest on Record. Geophysical Research Letters 23(1):57–60. ↑ Climate Glossary. Australian Bureau of Meteorology. Retrieved October 16, 2008. Caviedes, César N. 2001. El Niño in History: Storming Through the Ages. Gainesville, FL: University of Florida Press. ISBN 0813020999. Davis, Mike. 2001. Late Victorian Holocausts: El Niño Famines and the Making of the Third World. London, UK: Verso. ISBN 1859847390. Fagan, Brian M. 1999. Floods, Famines, and Emperors: El Niño and the Fate of Civilizations. New York, NY: Basic Books. ISBN 0712664785. Glantz, Michael H. 2001. Currents of change. Cambridge, UK: Cambridge University Press. ISBN 052178672X. Philander, S. George. 1990. El Niño, La Niña and the Southern Oscillation. San Diego, CA: Academic Press. ISBN 0125532350. Trenberth, Kevin E. 1997. The definition of El Niño. Bulletin of the American Meteorological Society. 78(12):2771–2777. Retrieved October 16, 2008. Seasonal Climate Outlook, Values of the Southern Oscillation Index. The Long Paddock. Retrieved October 16, 2008. Cold (La Niña) Episodes in the Tropical Pacific. The El Niño Theme Page Explains El Niño and La Niña, provides real time data, forecasts, animations, FAQ, impacts and more. History of "El Niño-Southern Oscillation"
This page was last modified on 19 September 2017, at 16:22.